How long to poach eggs? The length of time needed to poach an egg is 3 minutes. The time needed to actually poach an egg is 3 minutes. This does not include the time it takes to boil the water. The clock starts when the egg is submerged into the water. Poaching eggs is a process of using water instead of direct heat to cook eggs out of their shell. Taking the time to make poached eggs is a healthier alternative to fried eggs since you don’t need to grease the pan. The resulting eggs are soft and creamy with a flowing yolk. The whites are whiter and the yellow is yellower in a properly poached egg. After three minutes in the water, the egg should be removed from the water. A poached egg may need seconds less or more, depending on how hot the water actually is. Too gentle of a boil will take slightly longer and too hard of a boil is even less desirable as it will probably crack open the egg yolk. So, at a normal soft boil, an egg will be poached in 3 minutes. Make sure it’s been at least 2 minutes or you’ll have a running white and if the egg boils up until 4 minutes the yellow will begin to firm up and set. You will notice that the egg starts at the bottom of the pan and then rises to the surface when it is done in about three minutes. Be sure that the whole egg is covered with water, gently spooning water on top of the yolk if it floats above the water. When a poached egg is cut in half, the visual should compare to a gentle lava flow (not an eruption). Poached eggs are best eaten immediately, or after being ladled with a nice hollandaise sauce. Can poached eggs be reheated? Yes, poached eggs actually reheat quite well. If you made too many, they can be covered airtight and placed into the refrigerator for two to three days. To reheat, remove them from the refrigerator while boiling more water in a pan and then simply slip the poached eggs back into boiling water to reheat. How long to reheat poached eggs? This time, only keep them in the water for about a minute to a minute and a half. Amazingly, the yolk will be warm and yet still be velvety! 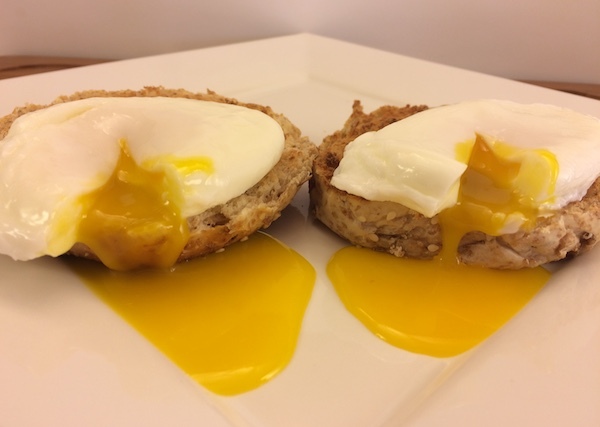 For details on how to make poached eggs, see our post on how to poach eggs. 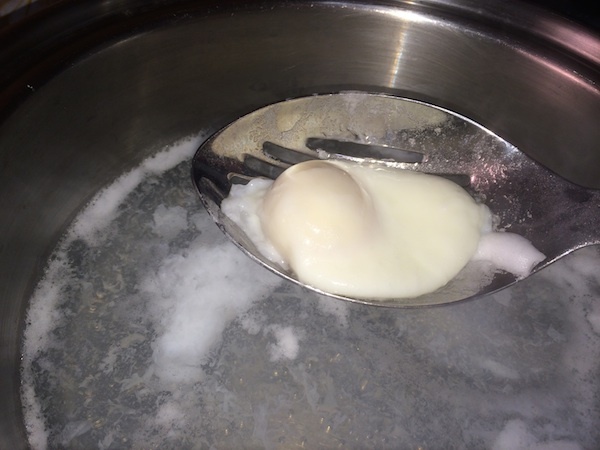 If you like your eggs firmer, check our post on how to make hard boil eggs. If you’ve made too many hard boiled eggs, try turning them into deviled eggs. To find out the difference between brown and white eggs, check here. To find out how long eggs last, visit our egg page. And, to find out how long hard boiled eggs last, see our hard boiled egg page.